The army of the Ming dynasty was the primary military apparatus of China. It was founded in 1368 during the Red Turban Rebellion by the Ming founder Zhu Yuanzhang. The system of soldiery was largely hereditary and soldiers were meant to be self sufficient. They were grouped into guards (wei) and battalions (suo), otherwise known as the wei-suo system. The guard battalion system went into decline around 1450 and was discarded in favor of mercenaries a century later. This is a family tree of Chinese emperors from the Mongol conquest of 1279 to the end of the Qing dynasty in 1912. The Collected Statutes of the Ming Dynasty (simplified Chinese: 大明会典; traditional Chinese: 大明會典; pinyin: Dà Míng Hùidǐan) or Collected Regulations of the Great Ming is a five-volume collection of regulations and procedures of the Ming dynasty (1368–1644). 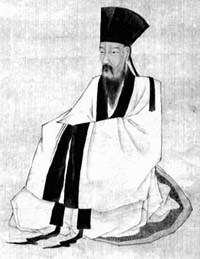 After the original compiler Xu Pu (1429–1499) died, the task was taken over by Li Dongyang (1447–1516) and Shen Shixing (申時行). The books took 11 year to complete and were published in 1509. 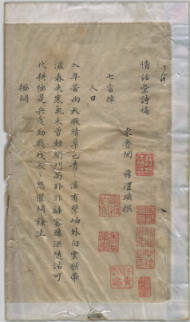 A second edition was commissioned in 1576, resulting in the alternative name: Wanli huidian (萬曆會典), which was completed in 1587 and covers the years between 1479 and 1584. The 1587 edition was reproduced as a facsimile in Beijing by the Zhonghua Book Company in 1988. The Da Ming Baochao (simplified Chinese: 大明宝钞; traditional Chinese: 大明寶鈔; pinyin: dà míng bǎo chāo) was a series of banknotes issued during the Ming dynasty in China. They were first issued in 1375 under the Hongwu Emperor. According to the Ch'uan Pu T'ung Chih an estimated sixty different Ming dynasty notes issued, however the actual number may have been higher. Although initially the Da Ming Baochao paper money was successful, the fact that it was a fiat currency and that the government largely stopped accepting these notes caused the people to lose faith in them as a valid currency causing the price of silver relative to paper money to increase to the point that by the mid 1400s 1000 guàn of paper money was needed to pay for only an ounce of silver. The negative experiences with inflation that the Ming dynasty had witnessed signaled the Manchus to not repeat this mistake until the first Chinese banknotes after almost 400 years were issued again in response to the Taiping Rebellion under the Qing dynasty's Xianfeng Emperor during the mid-19th century. Today extant specimens of Da Ming Baochao banknotes are extremely rare however two discoveries of them during the early 20th century caused a great number of the 1 guàn denomination banknotes issued under the Hongwu Emperor to end up in the hands of museums and private collectors. Eastern Depot or Eastern Bureau (traditional Chinese: 東廠; simplified Chinese: 东厂; pinyin: Dōng Chǎng; Wade–Giles: Tung Ch'ang) was a Ming dynasty spy and secret police agency run by eunuchs. It was created by the Yongle Emperor. The economy of the Ming dynasty (1368–1644) of China was the largest in the world during that period. It is regarded as one of China's three golden ages (the other two being the Han and Tang periods). The period was marked by the increasing political influence of the merchants, the gradual weakening of imperial rule, and technological advances. The Four Masters of the Ming dynasty (Chinese: 明四家; pinyin: Míng Sì Jiā) are a traditional grouping in Chinese art history of four famous Chinese painters of the Ming dynasty. The group are Shen Zhou (1427-1509), Wen Zhengming (1470-1559), both of the Wu School, Tang Yin (1470-1523), and Qiu Ying (c.1494-c.1552). They were approximate contemporaries, with Shen Zhou the teacher of Wen Zhengming, while the other two studied with Zhou Chen. Their styles and subject matter were varied. Imperial Commissioner (simplified Chinese: 钦差大臣; traditional Chinese: 欽差大臣; pinyin: qīn chāi dà chén; Manchu: ᡥᡝᠰᡝ ᡳᠲᠠᡣᡡᠷᠠᡥᠠᠠᠮᠪᠠᠨ hese i takūraha amban) was a high-ranking government official or military general commissioned by the emperor of China during the late Ming (1368–1644) and Qing (1644–1911) dynasties. His power was just below that of the emperor, such that he could command viceroys and provincial governors by imperial edict. The Ming dynasty ruled China from 1368 to 1644, succeeding the Mongol-led Yuan dynasty and falling amidst much peasant turmoil to the Manchu-ruled Qing dynasty. Sixteen emperors ruled over the whole of China spanning 276 years. A series of claimants to the Ming throne continued to claim the throne of what was known as the Southern Ming until the last was executed in 1662. According to the rules of the imperial house, the first character of the names of Ming princes is a generation name, while the second character contains a character radical that cycles through the five elements of Chinese philosophy, namely, 木 (wood) 火 (fire) 土 (earth) 金 (metal) 水 (water), starting from the generation after imperial founder Zhu Yuanzhang. Chinese coinage in the Ming dynasty saw the production of many types of coins. During the Ming dynasty of China, the national economy was developed and its techniques of producing coinage were advanced. One early period example is the Bronze 1 cash. Obverse: "HUNG-WU T'UNG-P'AO" (洪武通寶). Reverse: blank. Average (18 specimens) 23.8 mm, 3.50 grams (the weight vary considerable and we have records of specimens from 2.2 to 4.1 grams). During the Ming dynasty (1368–1644), Chinese painting progressed further basing on the achievements in painted art during the earlier Song dynasty and Yuan dynasty. The painting techniques which were invented and developed before the Ming period became classical during this period. More colours were used in painting during the Ming dynasty. Seal brown became much more widely used, and even over-used during this period. Many new painting skills/techniques were innovated and developed, calligraphy was much more closely and perfectly combined with the art of painting. Chinese painting reached another climax in the mid and late Ming. The painting was derived in a broad scale, many new schools were born, and many outstanding masters emerged. The Ming tombs are a collection of mausoleums built by the emperors of the Ming dynasty of China. The first Ming emperor's tomb is located near his capital Nanjing. However, the majority of the Ming tombs are located in a cluster near Beijing and collectively known as the Thirteen Tombs of the Ming Dynasty (Chinese: 明十三陵; pinyin: Míng Shísān Líng; literally: 'Ming Thirteen Mausoleums'). They are within the suburban Changping District of Beijing Municipality, 42 kilometres (26 mi) north-northwest of Beijing city center. The site, on the southern slope of Tianshou Mountain (originally Huangtu Mountain), was chosen based on the principles of feng shui by the third Ming emperor, the Yongle Emperor. After the construction of the Imperial Palace (Forbidden City) in 1420, the Yongle Emperor selected his burial site and created his own mausoleum. The subsequent emperors placed their tombs in the same valley. From the Yongle Emperor onwards, 13 Ming dynasty emperors were buried in the same area. The Xiaoling tomb of the first Ming emperor, the Hongwu Emperor, is located near his capital Nanjing; the second emperor, the Jianwen Emperor, was overthrown by the Yongle Emperor and disappeared, without a known tomb. The "temporary" emperor, the Jingtai Emperor, was also not buried here, as the Tianshun Emperor had denied him an imperial burial; instead, the Jingtai Emperor was buried west of Beijing. The last Ming emperor buried at the location was the Chongzhen Emperor, who committed suicide by hanging (on 25 April 1644). He was buried in his concubine Consort Tian's tomb, which was later declared as an imperial mausoleum Si Ling by the emperor of the short-lived Shun dynasty, Li Zicheng, with a much smaller scale compared to the other imperial mausoleums built for Ming emperors. During the Ming dynasty the tombs were off limits to commoners, but in 1644 Li Zicheng's army ransacked and set many of the tombs on fire before advancing and capturing Beijing in April of that year. In 1725, the Yongzheng Emperor of the Qing dynasty bestowed the hereditary title of Marquis on a descendant of the Ming dynasty imperial family, Zhu Zhiliang, who received a salary from the Qing government and whose duty was to perform rituals at the Ming tombs, and was also inducted the Chinese Plain White Banner in the Eight Banners. Later the Qianlong Emperor bestowed the title Marquis of Extended Grace posthumously on Zhu Zhuliang in 1750, and the title passed on through twelve generations of Ming descendants until the end of the Qing dynasty. Presently, the Ming Tombs are designated as one of the components of the World Heritage Site, the Imperial Tombs of the Ming and Qing Dynasties, which also includes a number of other locations near Beijing and in Nanjing, Hebei, Hubei, Liaoning province. The exact nature of relations between Tibet and the Ming dynasty of China (1368–1644) is unclear. Analysis of the relationship is further complicated by modern political conflicts and the application of Westphalian sovereignty to a time when the concept did not exist. Some Mainland Chinese scholars such as Wang Jiawei and Tibetan scholars such as Nyima Gyaincain, assert that the Ming dynasty had unquestioned sovereignty over Tibet, pointing to the Ming court's issuing of various titles to Tibetan leaders, Tibetans' full acceptance of these titles, and a renewal process for successors of these titles that involved traveling to the Ming capital. Scholars within China also argue that Tibet has been an integral part of China since the 13th century and that it was thus a part of the Ming Empire. But most scholars outside China, such as Turrell V. Wylie, Melvin C. Goldstein, and Helmut Hoffman, say that the relationship was one of suzerainty, that Ming titles were only nominal, that Tibet remained an independent region outside Ming control, and that it simply paid tribute until the Jiajing Emperor (1521–1566), who ceased relations with Tibet. Some scholars note that Tibetan leaders during the Ming frequently engaged in civil war and conducted their own foreign diplomacy with neighboring states such as Nepal. Some scholars underscore the commercial aspect of the Ming-Tibetan relationship, noting the Ming dynasty's shortage of horses for warfare and thus the importance of the horse trade with Tibet. Others argue that the significant religious nature of the relationship of the Ming court with Tibetan lamas is underrepresented in modern scholarship. In hopes of reviving the unique relationship of the earlier Mongol leader Kublai Khan (r. 1260–1294) and his spiritual superior Drogön Chögyal Phagpa (1235–1280) of the Sakya school of Tibetan Buddhism, the Yongle Emperor (r. 1402–1424) made a concerted effort to build a secular and religious alliance with Deshin Shekpa (1384–1415), the Karmapa of the Karma Kagyu school. However, the Yongle Emperor's attempts were unsuccessful. The Ming initiated sporadic armed intervention in Tibet during the 14th century, but did not garrison permanent troops there. At times the Tibetans also used armed resistance against Ming forays. The Wanli Emperor (r. 1572–1620) made attempts to reestablish Sino-Tibetan relations after the Mongol-Tibetan alliance initiated in 1578, which affected the foreign policy of the subsequent Qing dynasty (1644–1912) of China in their support for the Dalai Lama of the Gelug school. By the late 16th century, the Mongols were successful armed protectors of the Gelug Dalai Lama, after increasing their presence in the Amdo region. This culminated in Güshi Khan's (1582–1655) conquest of Tibet from 1637–1642 and the establishment of the Ganden Phodrang regime by the 5th Dalai Lama with his help. The Wanli Emperor (Chinese: 萬曆帝; pinyin: Wànlì Dì; 4 September 1563 – 18 August 1620), personal name Zhu Yijun (Chinese: 朱翊鈞; pinyin: Zhū Yìjūn), was the 14th emperor of the Ming dynasty. "Wanli", the era name of his reign, literally means "ten thousand calendars". He was the third son of the Longqing Emperor. His reign of 48 years (1572-1620) was the longest among all the Ming dynasty emperors and it witnessed the steady decline of the dynasty. Zheng Zhilong, Marquis of Tong'an and Nan'an (Chinese: 鄭芝龍; pinyin: Zheng Zhilong; Wade–Giles: Ching Chih-lung; 1604–1661), baptised as Nicholas Iquan Gaspard, was a Chinese merchant, pirate, political and military leader in the late Ming dynasty who later defected to the Qing dynasty. He was from Nan'an, Fujian. He was the father of Koxinga, Prince of Yanping, the founder of the pro-Ming Kingdom of Tungning in Taiwan, and as such an ancestor of the House of Koxinga. After his defection, he was noble titles by the Qing government, but was eventually executed because of his son's continued resistance against the Qing regime.